When I was nine years old my parents moved our family to Tulcea, in the Romanian province of Dobrogea, perched on the Danube Delta some one-hundred fifty miles east of Bucharest – right where the river ends and the Black Sea begins. My father, a Romanian, originally came from Transylvania; my mother, a Ukrainian, from a village of refugees some thirty miles further east of Tulcea. At home we spoke two languages, and, since my mother’s side followed the Old Calendar, we always had to observe two rounds of religious celebrations. As it turned out this domestic diversity prepared me well for life in Tulcea. We settled in the district of the Lipovans, a Russian Christian sect persecuted by the Tsars for refusing to “modernize” their religious rituals in the seventeenth century. Since then, many had fled to Romania, especially to the Danube Delta, where they were less likely to be caught and shipped back to Mother Russia. There my father – and then my mother, jointly with him – was headmaster of the local primary school, School No. 7, at 76 Libertatii Street. Our two-bedroom apartment was inside the school itself. 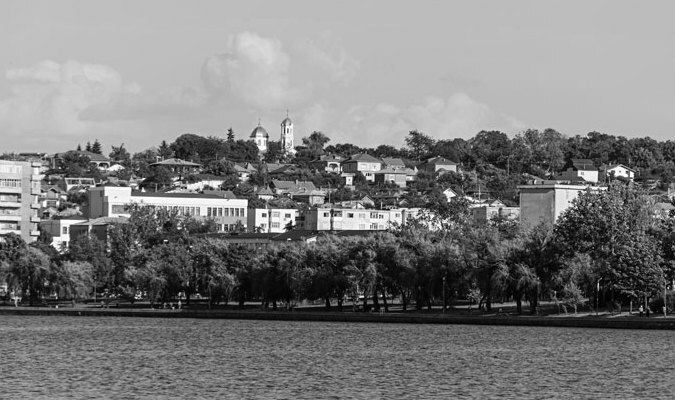 The years when I came to know Tulcea, in the mid-1970s, were perhaps the last when its reputation as a cosmopolitan city – a vestige from its days as a frontier town home to a myriad of cultures and religions, and just within the northern limes of the old Ottoman empire – was to some extent still accurate. On my way to high school, I would pass the Catholic church, catching timid glimpses of its interior and snatches of organ music when the door was ajar. I could see through the gap a plaster statue of Christ in the half-shade of the vernacular Gothic atmosphere. Further downtown, the Greek Orthodox church followed, a temple of sorts that had been left towerless: next to it the Romanian cathedral of St. Nicholas more than compensated with enough height for both of them. I knew the Greeks well. One of my great-uncles married the daughter of a well-to-do Greek merchant from Sulina, Romania’s easternmost town, and a seaside “Europolis” of sorts. Grain, ships, olives and lokum (the sweet also known as “Turkish delight”) were the topic of any discussion in the attractive house that was their home – until the 1980s, when they sold it to a Gypsy family for virtually nothing and moved into a block of drab flats. In those days everybody was abandoning their houses “voluntarily” for fear of random demolition – the official name for it was “systematization of national territory” – and thus becoming tenants of the grand landlord of the state. In the city center there was a Bulgarian Orthodox church. Now this church sported a clock and – strangely fanciful for an Orthodox church – a Romanesque nave graced with two kidney-like windows instead of a rosace. These, the priest once explained to me, probably off the top of his head, “were” the tears of Jesus. Very near the Bulgarian church I could see the synagogue on Babadag Street. At one point Babadag Street “needed” to be straightened, and, alas, the synagogue “had” to be destroyed, in accordance with one of the many “systematization” designs that erased the old cities and villages of Romania in the 1970s and – especially violently – the 1980s. Countless old houses, treasures of authentic ethnic and architectural diversity, were duly demolished and replaced by blocks of the same monotonous flats that supposedly exemplified our “national specificity” – the official style, in the nationalistic Communist rhetoric of the day. In Tulcea there were very few Jews left by then, most having left for Israel or the West, and they were too old to protest, anyway. One of the last of the Jews to leave was a watchmaker whose shop I used to pass by every day. I’d see him at work through the window, he, in turn, peering into the inner workings of his shiny little machines, time and motion under his eyes and between his fingers. My father had bought my first watch from him, a sleek Swiss-made Coresa, and two bracelets for my mother and sister, when he was selling everything he owned in preparation for his emigration. Apparently, however, the expatriates didn’t forget, and, probably due to sufficient pressure from abroad, the Babadag Street synagogue’s threatened demolition in the eighties – when everything else was succumbing to the inferno in Romania – was averted at the last moment. In the same manner the local Jewish cemetery escaped the fate that many other cemeteries, especially in Bucharest, did not: that of being erased, turned into a no-man’s-land and then transformed again into a concrete desert of flats where children alone would grow wild and weedy, unsupervised by proletarian parents whom the proletarian state obliged to work long shifts. Probably the most disturbing “conversion” was that of a Bucharest cemetery which was turned into outdoor pool. That was too much: spooky stories about the ghosts of the place, malefic waters and a sort of commonsensical decency of a highly religious people prevented the place from being used. Even today it is mostly deserted, in spite of the decades that have passed. Who knows what became of the bodies? En route to my high school – when we still lived in the headmaster’s quarters of Primary School 7 – I used to take a short-cut through the courtyard of the Lipovan church. I recall my astonishment when once I happened upon the funeral of a venerable lady whom everyone called Băbica (“little old woman”): the priests read, whispering into her ears, for two days straight, without interruption, from some old sacred books in Slavonic, a language not even the Lipovans themselves understand anymore: a dead language for a dead woman. Perhaps, I thought, it was not so different from the way the Tibetans recited their sacred Bardo Thodol, their Book of the Dead. The exterior of the Lipovan church was painted an oil-based green, just like many of the Lipovan houses that surrounded it, and adorned with crêpe paper on feast days. Its icons were mounted in brass and silver, the golden nimbi and bearded faces of the saints barely visible from the depths of their precious cocoons. The Lipovan women, bedecked in a rich delirium of colourful gowns and kerchiefs, walked in stately parade behind their husbands, who wore their beards over traditional rubashka tunics all the way down to their belts. They were the same men who sold us the roe and the fish they’d taken from the river and the sea, asking “one more penny per pound” if the fish were still alive. Then I would reach the banks of the Danube. It was a poetic setting: the river and the birds, and the rowboats and the tarred ropes linking the barges to the shore. For a boy with literary dreams, nothing could have been more hospitable to “inspiration”, especially with the sun declining on my way home from school in the evenings. What might have seemed a mere walk on the banks (faleza in Romanian, or corso) was in fact an important social statement, a parade, a display of status. Changes in wardrobe, work, or family and married life were made public and commented upon here during lazy strolls that mirrored the leisurely pace of the exhausted river. The banks not only formed the backbone of the town, but were also its most interesting site. Social contacts, promenades, urban life – everything happened there. The faleza had its own almost private areas: high school and college students met at the “little graves” (floral pockets inserted into the concrete path); the thugs had their “headquarters” at the Danubius restaurant. At the two opposite ends – one leading to the Old Market and the other to Union Plaza – sat the perpetual retirees, putting everything through the gossip grinder. Every gesture we made as walking “actors” became public and subjected to censorship or dissemination. My parents did not really have to supervise my long walks: by the next day, they would know how I had behaved, whom had I befriended, whom I had not properly greeted, and so on. Walking along the banks with one’s significant other was more efficient than publishing betrothal banns; conversely, walking alone was the announcement of a drama, or perhaps of an opportunity. To stop walking on faleza meant either an exile from the public realm or death – so important was it. Then Ceauşescu launched his ambitious programme to transform the administrative geography of Romania and, in the process, to galvanize a nationalistic discourse that would very soon have institutional and physical effects on the major cities. The rhetoric of Latin origins permeated the city structure, albeit without any of the Roman beauty that had presumably, in part, inspired it. Tulcea duly became the county “capital” and, along with all the other forty such “capitals”, a “municipium”. Now, any muncipium, as history tells us, needs a “forum”. Therefore, a major campaign to build these so-called “new civic centers” was kicked off in 1967 and lasted until 1987, when the forum of the northwestern town of Satu Mare, the last – and arguably most flamboyant – was finished. Basically, behind the Neo-Latin rhetoric, every “municipium” in Romania saw its urban core demolished and rebuilt, with a major edifice for the local party and administration headquarters, a “house of culture of the workers’ union”, a supermarket, and perhaps several blocks of flats of better quality for the local political elite erected in its place. It resembled Mussolini’s project to rebuild the central structure of several Italian cities in the 1920s and 1930s, with Brescia, to me, being the most striking example of the opposition between the Medieval and the Fascist paradigms. Of course, bronze statues of certain major figures from Romanian history had to be enthroned in the new parade squares. On the second floor, every single party building – necessarily the most impressive in each city – had a loggia overseeing the otherwise empty square. Ceauşescu’s official visits to the counties were the only reason “the working masses of people” would gather there, not, of course, by their own free will, to admire the president and to be themselves surveyed by him and his court. In Tulcea, as everywhere else, the civic square was usually empty: the real city center was still, for the time being, the faleza, not this purposeless concrete surface deliberately built away from it. There was, it is true, another moment when people gathered in the so-called “civic centers”, this time of their own free will. That came in December 1989, when they attacked and besieged the monstrous edifices of Communist power that symbolized the regime itself. They were never real public buildings anyways, not even in the Habermasian sense, as the state that produced them was hardly “concerned with the public, general well-being of all its citizens”. Today these squares are once again voids, blank horizontal surfaces without events to fill them, without life, passages perhaps from one interesting corner of the city to another, but neither agoras, nor forums, nor market squares. The biggest surface of this kind is in Bucharest, far from the Delta, in front of the House of the Republic: for the second most massive building in the world needed, naturally, a square to match it. Ceauşescu never managed to “use” it for the mass parades that he dreamed he would watch from the distant balcony at the top of that building – really an artificial hill made to replace the natural one that had overlooked the site before being flattened. He was shot in December 1989, but even today they are still working to finish the interior of the House, only to find as they do so that the long-completed lower levels by now need restoration, or, like the heating and plumbing systems, total replacement. There is no way this can be done in the foreseeable future: instead, we will continue to see a contemporary ruin in the making, as impervious to repair (it’s a simply unmanageable building) as to demolition (it’s designed to resist the strongest earthquaqes and atomic bombardments). The square itself is more popular: every now and then, a big concert, like Pavarotti’s during the eclipse in August 1999, will be held there, against the backdrop of the House; sometimes the Gypsy parties use it for their political rallies, and their elites rent the House’s restaurant for flamboyant weddings; oh, and yes, the rare military parade does roll over it. On any other summer day, it acts like a mirror to heat up the city’s already furnace-like atmosphere. There are sort-of-fountains along the Victory of Socialism-turned-Union Boulevard that leads to the square and house, but their obvious purpose is definitely exhibitionist rather than in any way functional. But all this still belonged the future during my schoolboy days in Tulcea. Looking towards the the extreme eastern end of the Danube faleza I’d see the town’s great mosque, still in use when my family arrived in the city. There was a time when no church steeple was allowed to exceed its minaret in height. In fact, that was the only religious restriction imposed on the Christians in Tulcea during the Turkish empire. The Turks, fanatics as they may have been elsewhere, sometimes became meek on the edges of their empire, permitting other religions to survive alongside Islam, the empire’s official religion. What’s more, churches and monasteries were even built in the first half of the 19th century: with modest means, of course, but then Dobrogea as a whole was never a particularly rich area – a barren land with few resources other than its chalky stone and its numerous sheep. All the same, imperial meekness aside, the height restriction was not an entirely trivial one, since the mosque was located at the lowest point in the city, whereas the churches were spread over the city’s – of course! – seven hills. After 1878, when, following a Russian-Romanian-Turkish war, the whole region of Dobrogea was united with Romania proper, all the churches raised their spires “against” the monumental mosque. But the tall minaret still dominated the broad amphitheater through which the city, turning north, opened up towards the Danube. Taking in view the whole skyline of the city, from west to east, one would see first the spires of the Orthodox Church in the Heroes’ Cemetery, where my mother’s little pupils would occasionally bring flowers to old enemies who lay at last in silence, side by side; then the Lipovan church near the Old Market; the Greek church and the Romanian Cathedral of St. Nicholas, then two more Lipovan churches set next to each other on Hora Hill; finally, the minaret of the mosque from which the muezzin would still utter his calls while I was yet an adolescent. We could hear his plaintive tone all the way from the terrace of “Little Carnation”, the sweets shop with the best rose ice cream in the world. Its recipe left this world along with the Turk who used to make it, the last owner of the shop before it was nationalized. Among the Turkish and Tatar girls and boys at school, too, I had friends. Later on, granted, they married amongst themselves. Back then, however, these rather distant events did not bother our friendships. I still dream today about the baklava made by the mother of one of my Turkish friends. At that time, too, the very architecture of the city celebrated the same mutual forbearance. The neoclassical brick construction of the 1851 Orthodox cathedral gracefully complemented the Ionian Greek church and the sandstone of the mosque and synagogue. How did this neoclassicism come to Tulcea, and from where? And furthermore, how did it find its way into Orthodox architecture, otherwise unchallenged in its Byzantine timelessness? Was it perhaps the influence of the cosmopolitan atmosphere that drew French and especially Italians to work for the granite carrières, the open-cast mines? Was it because, due to its many ships, Tulcea was closer to other harbors in the “outer” world than to its “motherland” across the Danube? 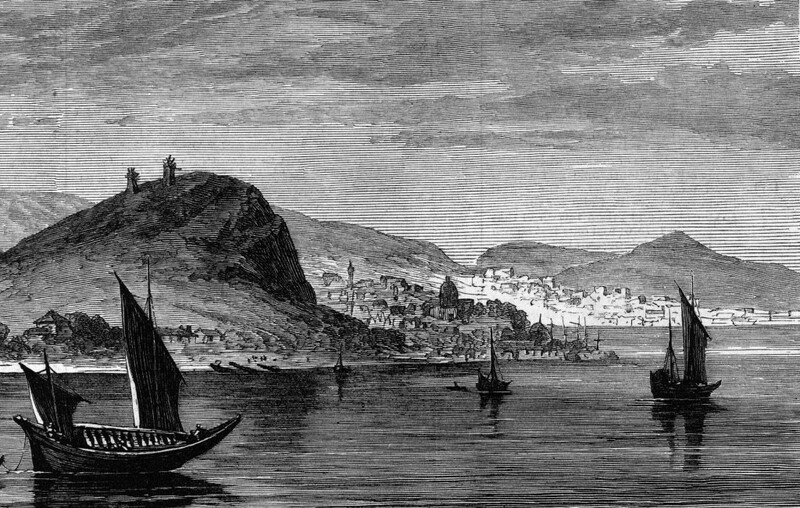 Those ships, too, may have carried the founders of Tulcea’s Baptist church, Romania’s first. Members of the various ethnic groups gravitated around their respective churches, forming their own neighbourhoods and living together – and with others – for centuries. Many a church at the heart of such quarters resembled more its surrounding houses than any over-glorified monument. The same painters, masons, and other artisans – amongst the Lipovans as others – were the builders of homes and churches alike. Beside each church, flower gardens would sprout up amongst the graves, and at their homes, usually next door, the priests tended their vegetable gardens and raised their chickens, and likewise down the street until the colours of one neighbourhood gently bled into those of another, before coalescing again around another church. This model has in many ways become extinct in the last thirty years, a decade before and two after the events of 1989. It must be said that the town did not improve thereafter. Sometime towards the mid-1990s, the two main plants built in the late 1970s were shut down, leaving almost 40% unemployment behind them, roughly the same percentage of workers that had been brought into the city all of a sudden from other regions of Romania to man the new plants in the first place. The built environment has changed much for the worse: monolithic flats now occupy the space all the way to the banks of the Danube. Proximity to the Delta would have made tourism by far the most profitable option for the local economy, and one that was a reality before the huge plants were built, but given the damage (aesthetic and otherwise) to the waterfront, it is still not really seen by the local administration as viable way out. There is a point here: who would want to see a ruined Communist town when one has Bucharest – a much better example in that respect, with its own huge “new civic center” and gigantic House-of-the-Republic-turned-Palace-of-Parliament? Besides the minaret of the mosque, there were once no daring verticals. The city used to live in peace, a sleepy collection of ethnicities at the margins of history, their members enjoying their borsch, braga, tsatsiki, Greek or Turkish coffee (as you prefer), vodka and fish; visiting each other’s celebrations and commemorations; and going about the normal business of living and letting live, of giving and getting along. Now only our memories can still keep that old city alive. We, the younger generation, have deserted the place, and will return only to visit our parents as long as they are still alive. Relatives and friends, speaking strange languages and thinking differently but all treating each other with decency – and each other’s children with unbearably saccharine spoliation – have simply left or died. Yet memory is not nothing. These people and their ancestors have faded from Tulcea only after indelibly shaping my sense of harmony, of togetherness, of lived space – my being. The diverse architecture of their respective quarters, their churches and temples have marked and still give shape to the inner space of my memory, where my spirit can still freely wander the streets of Tulcea as I knew it. As in a vision, the patched town architecture, with its low scale, domestic accretions of stone and adobe and with its monuments saying more about the memory that is built into the word itself than about monumentality, still less of monumentalism, could even now rise before our eyes. The absurd regime is gone; its absurd abuse of that enchanted topography, of public and private space altogether, is history, albeit only some twenty-five years from the here and now. As the country finds its footing, the town could yet re-create itself along the same stable paths of coexistence and the domestication of space that once defined it. The reconstruction, the resurrection might require a kick-start or two: dynamite, for example, to get rid of the block of flats that, well, block – for what else they can do? – the natural amphitheatre through which Tulcea used to meet the arched Danube; tax incentives for investors in tourism and services; support for the local stone, brick and adobe factories, and for those who want to build or rebuild their own houses. One might even dare to hope for decent national politics, and perhaps a little interest from the Western world. And, not just in the meantime, a little patience. Augustin Ioan is one of Romania’s leading architects and architectural theorists. A professor at the Ion Mincu Institute of Architecture in Bucharest, his work centers on the theory and history of modern and contemporary architecture, as well as the configuration of sacred space in traditional and post-Communist contexts. His architectural portfolio includes a number of churches, Romanian Orthodox and otherwise, that have been commissioned and built since 1989 as part of a wave of ecclesiastical construction projects on which he has also commented widely in national and international media.